She didn’t plan to attack. 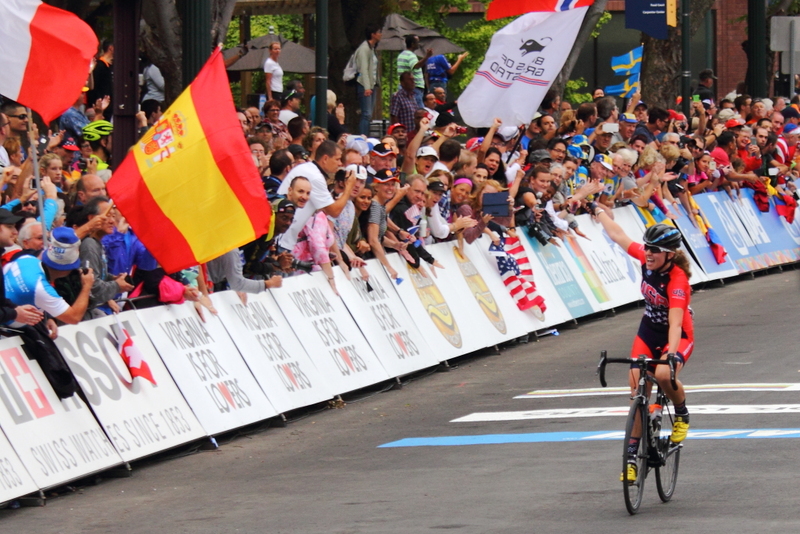 Chloe Dygert was simply stronger than any of the junior women in the seventy-plus world championship road race field sweeping around downtown Richmond, Virginia. So she pulled away from the lead group of four containing America’s Emma White, Poland’s Agnieszka Skalniak, and Juliette Labous from France. While Dygert sped away White reigned in the other leaders. Behind them by about 50 seconds, USA teammates Skylar Schneider and Ashlyn Woods monitored the pack. Dygert also took little credit for herself aside from owning up to targeting rainbow jerseys in both the time trial and the road race. She scored both of them. “Emma did an amazing job. At the beginning of the race there were attacks and she was up front, always on everything. I’m amazed and I’m so glad she’s on my team,” she said post-race. On the finish line Dygert decided not to raise her arms in a victory salute. “I don’t think there should be anything more than celebrating your team. I was just honored to be on Team USA and get a win for Team USA. “I have a great support system and I couldn’t have done it without their help and I’m just so grateful. Everybody’s just been there the whole way,” Dygert continued. Third place finisher Skalniak had something to prove too. The European time trial champion in her age group, she felt ill ahead of the Richmond time trial and didn’t perform as well as she had hoped. 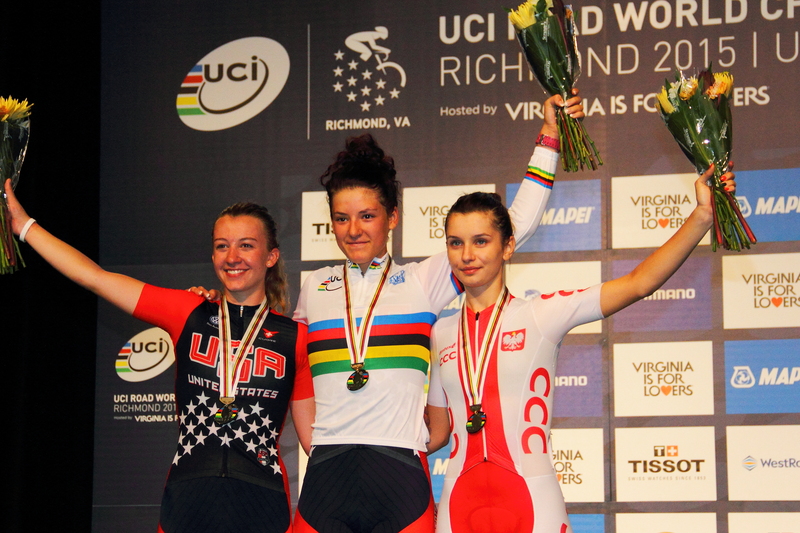 In 2014 Skalniak took the bronze medal in the junior women’s road race. It was important to repeat the feat, she said through an interpreter, to prove that last year’s result did not come by accident, that she is on the rise in her sport. Her medal was also an important signal for Polish women’s cycling. Jr women lap 1 approach 23rd St.